Judging by My Standards, I Should Have Won! Well, folks, it’s that time of year again. 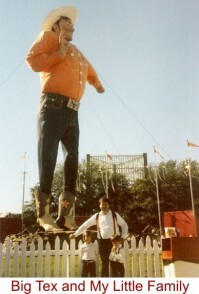 Time for the State Fair of Texas. Time for greasy corny dogs and even greasier funnel cakes. Time for football in the Cotton Bowl and a spin on the Tilt-a-Whirl. Time to get beat by a chicken at tic-tac-toe and for me, time for a twenty-year-old painful memory of apple pie. Perhaps I’d better explain. You see, I’m a girl who’s always in search of a good project, and when I find one, well, let’s just say I have a tendency to go a bit overboard. For example, the year my toddler grandson was going to be a Matador for Halloween, I hand-stitched gold sequins on his tiny traje de luces. When my children were babies, I not only made my own baby food – I grew the vegetables myself! And don’t even get me started on my elaborate annual Christmas card. 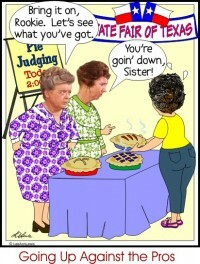 So it should come as no surprise that by the time I’d filled out and sent in the official entry form for the pie-judging contest at the Texas State Fair my mind was already spinning with ideas. According to the rules, my pie had to be on the table in the Women’s Pavilion no later than 8:00 on the morning of the contest so I set my alarm for 4:30. Next, using a tiny little star-shaped cookie cutter, I began cutting dozens and dozens of little stars from dough I had made the night before. I popped the unbaked stars back into the fridge to chill while I prepared my apples. And this is where even I admit that I went a bit too far because after peeling, coring and slicing my apples, I took that same cookie cutter and cut my apples into tiny little star shapes. That’s right. I said my apples! I poured them into the plate and then I painstakingly placed little star shapes of dough in concentric circles to form the top crust. For over two hours in the early morning silence of my kitchen I toiled on and on. "As easy as pie” could not have been further from the truth, but I didn’t care. A masterpiece was being created. Down at Fair Park I was a bit disconcerted to discover that there were more than fifty contenders vying for the coveted blue ribbon. This was going to be tough. After all, I was up against the pros here – the "Aunt Bea’s” of the world who had been doing this for years. What made me think a rookie like me stood a chance? 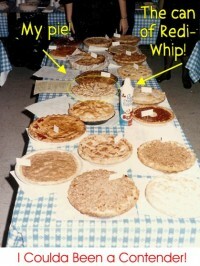 For a while my confidence wavered, until someone placed a pie next to mine, along with an accompanying can of Redi-Whip. "Give me a break,” I scoffed. Suddenly I felt a lot better. At least I would beat her. I have no idea why they wanted us there so early in the morning. It was way past two in the afternoon before the actual judging started, and while Marc and the kids took advantage of the gap by enjoying the fair, I couldn’t leave and consequently spent six solid hours with my bottom fused to a cold, hard folding chair. Finally, it was time. Onlookers gathered. The excitement built. Five judges were ceremoniously escorted in and seated at a table on the stage. Then, to my abject horror, several volunteers systematically went down the tables and scooped five forks-full of pie from the middle of each entry, wiped them onto a paper plate (in a motion akin to removing something unpleasant from the bottom of one’s shoe) and placed this unappetizing mess in front of the judges for tasting. The judges never even saw my beautiful star-studded creation, nor could they tell that my apples were meticulously star-shaped as well. Every one of those fifty disgusting plates looked exactly the same – with a single exception. On one of the plates, each bite was elaborately topped with a swirl of Redi-Whip. Betcha can’t guess which pie won. That’s right. Miss Redi-Whip! Oddly enough, I don’t remember being too devastated by the stinging loss. In fact, the clearest memory I have of the whole ordeal is what happened after the contest was over. I retrieved my entry (minus five bites from its middle), along with some plastic forks. Then my husband and I, along with our two kids, found a bench outside, and right there under the shade of Big Tex’s armpit, the four of us polished off that entire apple pie. It might not have earned a blue ribbon, but when it came to taste, the judges that really count declared that this one was definitely a winner! Search for That's Me All Over articles similar to "A Fair to Remember. Search all articles similar to "A Fair to Remember". List all That's Me All Over articles.